The Hometown Press is a newspaper and print shop located on the square in Sully, Iowa. Our news crosses the lines of Jasper, Mahaska, Marion, and Poweshiek Counties. Inside our weekly paper, you'll find community news, sports coverage, feature articles, school news, local classifieds and ads, business and city updates, a cooking column, and much, much more! 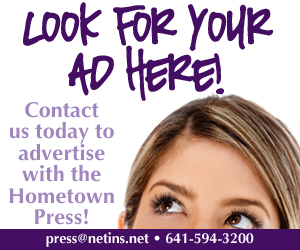 For all news inquiries, please email press@netins.net. Ad deadline: Mondays at 5 p.m.
News deadline: Tuesdays at 10 a.m.